This page is about the American fighter P-63A-5. For other uses, see P-63 (Family). The P-63A-5 Kingcobra is a Rank III American fighter with a battle rating of 3.7 (AB/RB/SB). This aircraft is a good all-altitude fighter. The A-10 can out-climb most of its opponents, un-upgraded, although "sideclimbing" is recommended when the higher altitudes are reached. Its straight line speed, especially at higher altitudes, is respectable, competing with 109s of the tier. This aircraft has a poor turn-time at slower speeds, but as with most US aircraft, its high speed performance is significantly better than the aircraft it faces, making it a good "boom and zoom" aircraft. 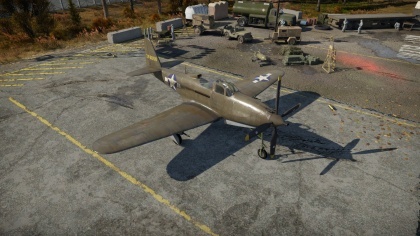 The improved 37mm gun improves damage to aircraft, since the 4 x 12.7mm Brownings are not greatly powerful at the higher tiers- the 37mm gun compliments the 12.7mms as a good bomber hunter, combined with the sleek profile of the aircraft. The aircraft is not intended, nor should be used, as a ground attack vehicle, since it can only carry one, 500lbs bomb and the ammunition count for the 12.7 mm guns is not great, 250 rpg- the 37mm gun can be used as ground attack, although this tactic isn't preferred by some as it reduces the ammo count as a whole for the aircraft, which is one of its limiting factors in combat. Tactically, the aircraft is good for small dives against turn-fighting opponents on the tail of your allies, from around 1000m or less above the target. 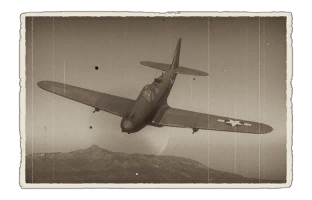 Keeping any "side-climbers" down is normally good, since the speed and rate of climb allow the P-63 to catch these planes and send them back down. An interceptor in any respect. Unlike most american designs the Kingcobra lacks heavy payload for ground attack duties. While the 37mm can load anti-tank rounds, the plane will lose it's excellent anti-air HE shells. Of course the 12.7 heavy machine guns can be used against planes, in a ground attack role they are rather used on soft targets, as the AP shell lacks high-exlposive damage radius to deal with AAA & SPAA quickly. The AP shells also require more accuary while shooting and thus are inferior to the .50cal Brownings on range e.g. with the HMG efective fire against light targets is possible from 600m, but with the 37mm AP shells this needs to be reduced to 400m. Powerful 37mm cannon with 4 12.7mm machine guns as backup. Centre mounted engine has a higher tendency to take damage in pursuits and from diving planes.